Moobear Designs is a brand new Australian children's clothing brand on the block, with a passion for the arts and crafts, sustainable living and the environment. And the designs are super-hip to boot! 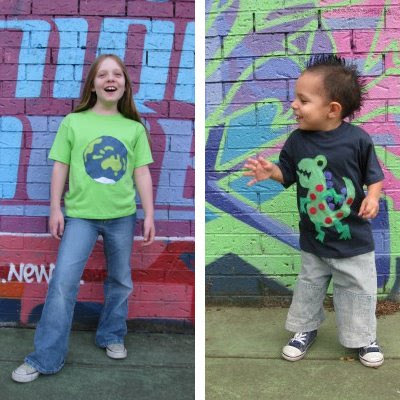 The lovely Stephanie and Carlos from Moobear Designs have created a cool line of t-shirts based on images drawn by their daughter Moo (that's the clever Moo pictured above in the fantastic green earth tee with cute-as-a-button Bear). Each item is handmade and unique, using recycled fabrics appliqued onto ethically-made and environmentally-friendly t-shirts. There are six original designs available with more to come soon. You can buy Moobear Designs clothing from the online store, and join the fun on the Moobear Designs blog where you'll learn all about the origins of the different designs. I dare you not to be caught up in Stephanie and Carlos' infectious enthusiasm and zest for life! 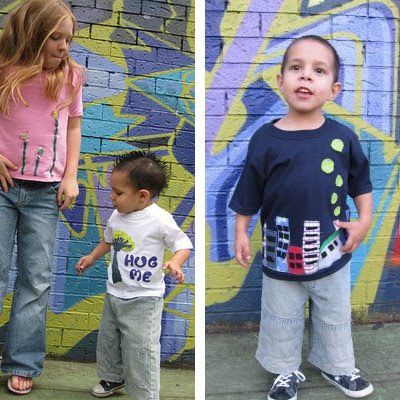 For more Australian children's clothes check out Bondville Kids: Australian Designer Baby Clothes. And shop online for kids fashion from great stores in the Australian Online Kids and Baby Store Directory. What an adorable idea! I love kid drawings, when I had my son (almost six years ago, gulp), I couldn't wait for the drawings to come. And they don't disappoint! I have them taped all over the place, plus files full and memo boards too. Okay I guess this comment is less about Moobear and more about a certain mom whose kid is turning six in a few days, LOL. Jess of course I'm happy to read your comments about anything, anytime! And a huge happy birthday to your little one - a very special occasion.